Founded by a college student in 2003, Insomnia Cookies delivers sweets to individuals and companies alike. Most stores are open seventeen hours a day, seven days a week. With more than 90 stores open, Insomnia Cookies Delivery stores handle orders for all sorts of calls. 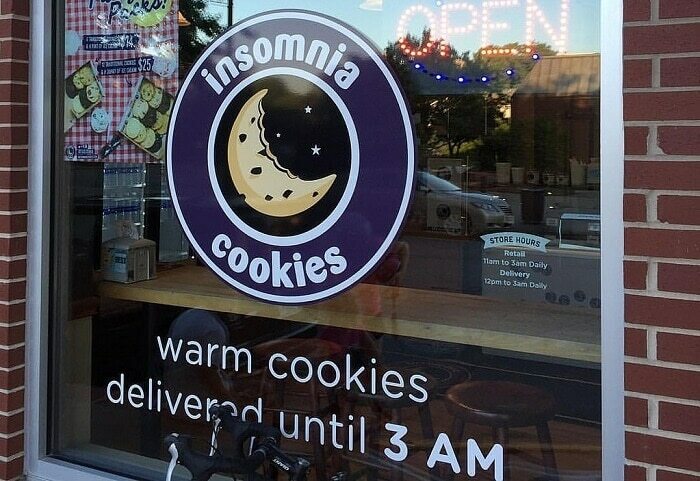 Here, you will find all you need to know about Insomnia Cookies Delivery and what they do. Despite the name, Insomnia Cookies doesn’t just serve cookies. In addition to the variety of cookies they sell, they also have ice cream, cookie cakes, brownies, ice cream cookie sandwiches, and drinks. To receive their array of sweets, customers can order online, in person, or through a call center. Their nearest store then has their drivers delivery the sweets. Insomnia Cookies employs its own drivers and uses them for such deliveries. Each store has a designated delivery area so that they can give customers fresh, warm cookies and other goodies. For this reason, they do not deliver outside of the designated areas. To serve people who don’t live near a store, Insomnia Cookies offers delivery of gift box treats. These gift boxes are delivered through the UPS system. WI – Madison, Milwaukee, Oshkosh. The average delivery takes anywhere from 30-45 minutes to complete. Generally speaking, each delivery area encompasses five miles or less so that the delivery is fresh upon receipt. The Insomnia Cookies Delivery website has a Cookie Tracker where customers can track the progress of their order. In case of difficulties with the tracker, it is possible to check up on an order by contacting their customer service as well. Insomnia Cookies Delivery charges a base fee of $1.99 for all deliveries. Due to the fact that they are not solely a delivery company, but more like a bakery that centers around deliveries, their fees are not too high. They also charge an automatic a tip of $2.99 for online delivery orders. This tip can be increased or decreased at the customers leisure. For gift boxes shipped through UPS prices go up. The cheapest delivery option is UPS Ground. This charges 12.99 for delivery. For faster delivery, Insomnia Cookies also offers UPS 2nd Day Air and UPS Next Day Air. 2nd Day charges around $27 and Next Day charges a little over $63. Insomnia Cookies Delivery does offer a reward program called the Cookie Dough Loyalty Program. For every dollar a customer spends, they get one loyalty point. Once the customer reaches 100 points, they get $10 off their next purchase. On orders that cost over $20, customers will earn 1.25 points per dollar spent instead of just one. Points do not apply to gratuity, tax, or delivery fees. Points are also not awarded for orders made through the call center. Insomnia Cookies Delivery also offers all sorts of specials. Besides their 6-pack deals, they also have Residence Hall Specials for bulk orders that consist of up to 300 cookies. For gift boxes they offer up to 24 cookies with an option for gluten free treats. There are still unfortunately plenty of areas and a number of states Insomnia Cookies cannot deliver to. However, they are constantly growing as a company. Currently, they have a number of stores in the process of opening and they do offer their gift boxes to anyone. Feel free to connect with them through their social media accounts. Not only do they have an official Facebook, Twitter, and Instagram, they even have a Snapchat as well! Hey Buddy!, I found this information for you: "Insomnia Cookies Delivery 101: Areas, Hours, Fees". Here is the website link: https://all2door.com/insomnia-cookies-delivery/. Thank you.